If you couldn’t tell, I’m a huge fan of decluttering my house. Now that I gave/threw away over 500 things, my goal is to not allow things in my house that I don’t necessarily want to have in it. 1.) Do I absolutely love it? I used to keep things just because it was too much of a hassle to return it and i would convince myself I might love it or need it one day. This mentality led to me having too much stuff that I only like (and not love), so I’m being more honest with myself now! I’ve learned that it’s better to have the perfect thing than the well-this-will-work-because-it-was-on-sale thing. 3.) Am I going to use this right away? If something is sitting in my closet taking up space, just waiting to be used, it’s probably not worth having around right now. I usually find it’s better to return it, stash away the money, and then buy it again at a more appropriate time. More often than not, I probably won’t end up repurchasing it. 4.) Is it what I expected? I do a lot of my shopping online, and this means that sometimes things show up and I don’t even remember ordering them. Or maybe something looked really awesome online and then it gets to my doorstep and it’s not what I expected. If a product isn’t exactly what I expected (unless i’m pleasantly surprised) it goes back. The same applies if I try something on in a store, think it looks great, and then I get home and realize it only fits okay and not great. Back it goes. 5.) If it was a gift, would I buy it for myself? Another mistake I’ve made in the past is keeping gifts because I feel guilty getting rid of something that was given to me by someone else. Plus, free is awesome, right?! If I don’t pay for something, there’s no harm in keeping it (was my thought process)! Well, now I’ve decided I’d rather have the cash in my pocket or the space in my closet/house. Even if I need to donate a gift, I am okay with it because the joy of the gift occurred during the giving, and not in me constantly seeing the unwanted item in my house and feeling possible resentment. Bottom line = have the same standards for gifts as you would if you were purchasing the item in a store with your own money. 6.) Does it fit well? Is it in style? Is it flattering? Do I want to wear it? 7.) Am I keeping this because of the sunk cost fallacy? I admit that sometimes I remember exactly how much I paid for something, and I can’t bear to get rid of it because of the ‘wasted’ money. Well, the money has already been spent, so whether or not I keep the item, I’m not getting the money back! It’s better to get rid of the product and not be constantly reminded of the money I (unwisely) spent on it. Of course, this doesn’t apply for items you can still return! Did I miss anything on this list? How do you determine what stays and what goes? 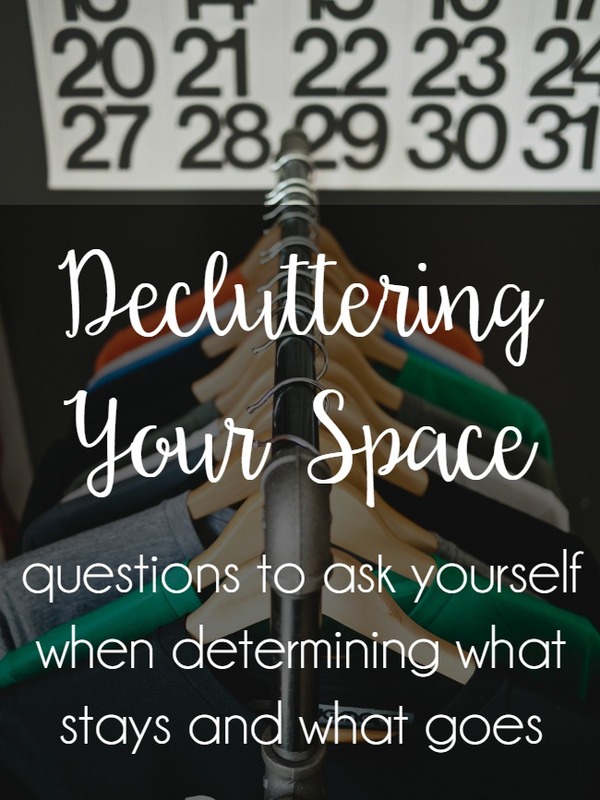 This entry was posted in consciously evolving, shopping and tagged decluttering, minimalism, shopping. Bookmark the permalink. Ohhhh I hope it’s going well for you! I find that it can be kind of difficult to get started but then in the middle of it I get way less picky about things I’m willing to get rid of. Very helpful. I fall victim to the gift guilt syndrome…. ME TOO! But I’m finally letting it go (both the guilt and the gift)! YES, gift guilt and sunk cost are my biggest downfalls. these posts of yours make me itchy to declutter EVERY TIME. this whole working outside the home thing is cramping my style. can my job be taking care of my kid and making my house awesome and simplified? I feel like I’d be better at that anyway. Hahahaha I’m pretty sure my job IS taking care of my kid and making my house more awesome and somehow I still don’t have the time/energy to do it all! It’s a slow process, but it’s coming together! Ugh the gift guilt…my mother in law, bless her. She works at K-Mart and purchases things when they go super on sale. She buys year round and stocks up for Christmas so we’re always getting way too many things. In the 8 years that I’ve been getting gifts from her, I’ve used maybe 15 things out of probably 100 individual items. I’ve got boxes of stuff she’s given just sitting in the garage because I have no use for it but feel bad getting rid of it. We’ve tried telling her that we don’t need so much stuff and that we’d rather her spend the same amount of money on something more substantial, but it hasn’t worked yet. I hope I’m not coming off as ungrateful, but I just wish she’d listen because the clutter stresses me out sometimes. Ohhhh if it’s in the garage just move it to Goodwill! That seems like an easy enough transition, but I totally understand the guilt. It’s hard when you’re dealing with people whose love language is gift giving. Just remember that they felt the joy and love when giving the gift and you felt it when receiving the gift… but that doesn’t mean you need to hold onto it! Hahahaha YAY for stock images! I haven’t been feeling as inspired with my camera lately – booooo.